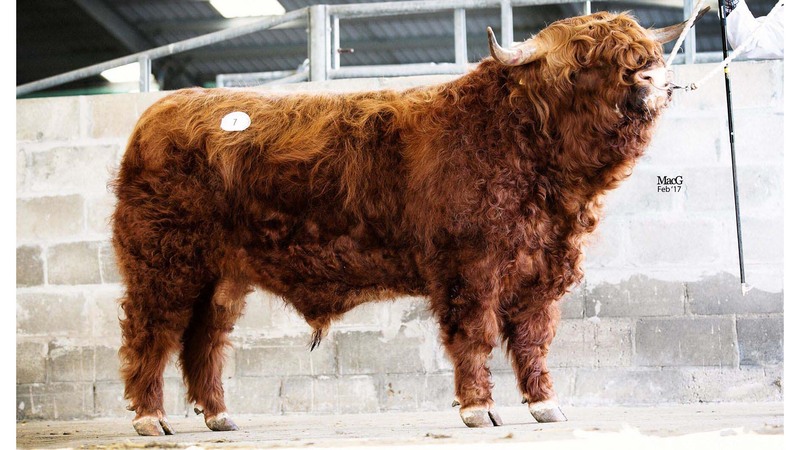 BULLS sold to average £3,536, up £1,721 on the year, and females £1,365, down £32, at the Highland Cattle Society spring sale, Oban. Top price was Angus Ruadh of Glengorm, from past society president Tom Nelson, Isle of Mull. 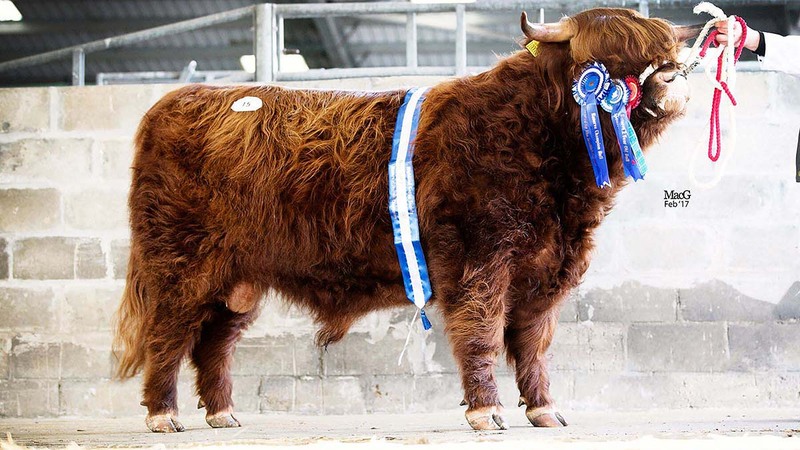 After winning its class, this March 2015-born bull sold to Inverinate Estate, Kyle, for 8,000gns. The overall male champion came from T.P. Radford, Lincolnshire, with his winning two-year-old bull Cameron Dubh of Kelby. 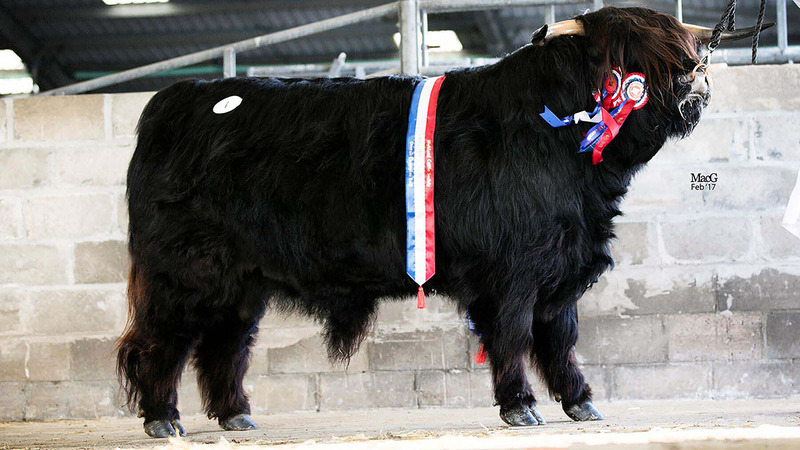 By Conan Dubh of Craigowmill, it found a new home with the Blingery Fold, Wick, for 6,500gns. The reserve male rosette was picked up by the reserve two-year-old, Douglas of Rannoch, from Donald MacNaughton, Kelty. By Reich of Rannoch, it was sold to Falko Stenberg, Germany, for 6,000gns. Mr Nelson’s Glengorm consignment followed, selling the two-year-old bull Archie Sauce of Glengorm for 5,200gns, to Messrs Stewart, Langraw. Female trade topped at 4,000gns, for a lot from Maureen MacArthur and John Ashton, Strathpeffer. The two-year-old Skye of Allanfearn is by Crusoe of Brue, and sold to Hendrick Hoof, Germany, for 4,000gns. Next female was a lot from Ken and Eva Brown, Kinross, with their second placed April 2013-born Isla Dubh 9 of Craigowmill. It was bought by Blingery Fold for 3,800gns. Cameron Dubh of Kelby was male champion and sold for 6,500gns. Reserve champion was Douglas of Rannoch, which sold for 6,000gns. Males, £3,536 (+£1,721); females, £1,365 (-£32).